Staff are fully trained using the latest cleaning and stain removal equipment. Environmentally friendly products are used and all the work is fully insured. Carpet cleaners ensure the carpets are left clean, deodorised and sanitised using a Thermadry system which ensures a quick drying time of approximately thirty minutes. Upholstery cleaners can clean specialist materials, provide professional general cleaning and stain and mark removal. We have specialist leather upholstery cleaners to ensure your leather looks it's best and is protected. 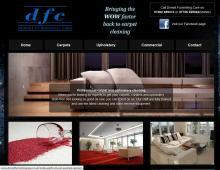 Dorset Furnishing Care provide free quotes for residential and commercial clients. Contact Dorset Furnishing Care for upholstery cleaning & carpet cleaning in Poole, Sandbanks, Canford Cliffs, Bournemouth, Ferndown, Swanage and Wareham.